I’m spending the summer on a study leave from Disability Concerns doing Clinical Pastoral Education (CPE) at Pine Rest Christian Mental Health Services working with men in their addiction recovery program and with men and women in their Adult Partial Hospitalization program. I’m planning to write several blogs this summer reflecting on my experiences. This is the first. 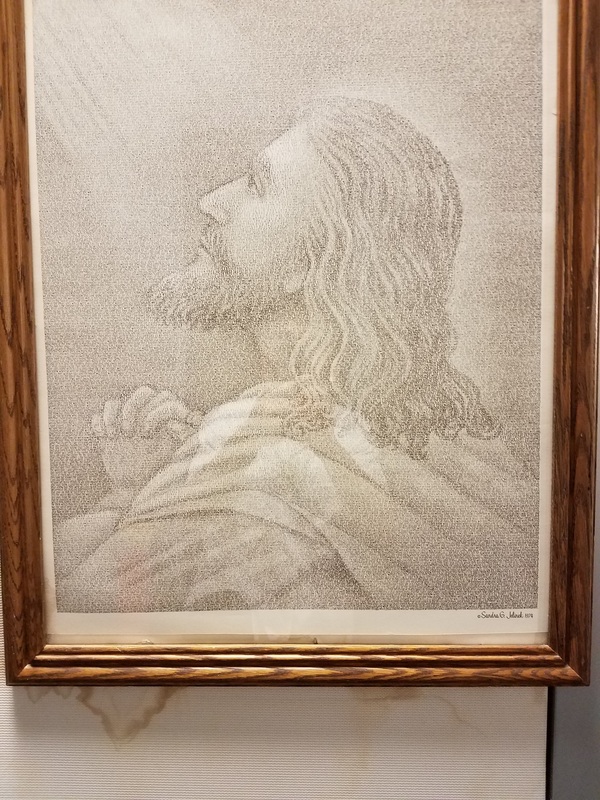 The decor of the chaplain’s office area includes a large word art of what Jesus might look like in prayer. It functions to remind us chaplains of Christ’s presence in our work and to hide a huge stain on the fabric of an office partition. Both functions remind me of CPE. At its heart chaplaincy is a healing, reconciling ministry of God, an expression and extension of God’s activity and mission in the world from the beginning of time. It is a pastoral ministry in specialized settings to people who are hurting or in crisis, uprooted or dislocated. Chaplains embody, or make present, the grace of God to these people where they live or work. This “ministry of presence” frequently occurs in places where God’s presence is least recognized or expected. Like the ministry of Christ, it is an incarnational ministry that is holistic in word and deed. Like Christ, chaplains find occasion to speak of God’s grace. Like Christ chaplains “embody” the grace of God to hurting people. Just as that word art reminds us that Christ is here among us, so our presence with people who are “hurting or in crisis, uprooted or dislocated” says, “Christ is here,” even though most often we do not use those words. That same mentor chaplain said that the men in the addiction recovery program are asking three questions of us, “Are you real? Do you care? Do you respect me?” Because the chaplain herself ministers Christ’s presence, what she does becomes secondary to who she is. CPE calls chaplains in training to identify their own feelings, history, and identity because Christ uses our presence as the primary tool for his work. Though a chaplain must take great care with self-disclosure to avoid turning the focus of the conversation on himself, he must be deeply aware of his own brokenness, suffering, trials, painful feelings, and struggles so that he can be fully present with the persons whom he serves. If he is not, he may quickly fall into advice-giving, condescension, and even disgust when ministering to another person. But adopting the perspective that “I too have weaknesses, faults, struggles, fears” helps the other to sense that the chaplain is a kindred spirit, not above or below, but with the other, just as Christ is with us in the midst of our greatest challenges. Frankly, I’d rather hide my own stains with a veneer of Jesus in prayer. I’m more comfortable with answers than questions, with authority than weakness, with qualification by academic degree than qualification by suffering, but I’m learning that effectiveness in chaplaincy requires me to walk into the circle of my discomfort. I admire the wisdom of the mentor chaplains with whom I’m working this summer, and I suspect that every one of them would say that they never arrive, they only continue on this rewarding and difficult journey. Thank you Mark for sharing. So much to mull over. Good training. It is true that men are prone to give advice when they should just shut up and listen. A woman who used to be a member of the church I attend, but who moved away some years ago went through a depression about 30 years ago, and at a party both of us attended her husband mused that when she told him how she felt his first response was to give advice, but that wasn't what she needed or wanted. Keep up the discipline, even if it goes against the grain. This is good Mark, I'll look forward to your other posts. Such a valuable learnings for all of us: ministering the very presence and grace of God, seeing suffering as our preparation for ministry, and seeing our own weakness as God's strength. Thank you.